What do you get when you combine a simple white cake with fluffy lemon buttercream frosting? LOL just kidding (but not really), you get a cake, silly! During the week, I find myself inexorably drawn towards cooking sites and the cooking sections of the bookstores. I now realize that what I’ve been doing is storing recipes and getting ideas for what I can bake during the weekends! So this week, I decided I wanted to try a simple white cake as I’ve never tried one that didn’t come out of a box before. I was also so inspired by Amanda’s (from iambaker) rose covered cake that I decided I wanted to give it a shot. My experience with frosting is (as previously stated) very limited, and as such I don’t own much equipment for decorating cakes and the such. Fortunately, last week I stumbled upon this amazing store in town called the “International Centre of Cake Artistry“. This store supplies everything and anything I could possibly think of using for baking. This, of course includes a Wilton 1M tip. Let’s just leave it at that for now, I don’t really feel like telling the internet (which might include my mum) what I bought. The best thing about having a very large extended family is the fact that there is a birthday to celebrate almost every other week. This might come as a pain if you’re one of those people who buy stuff for others, but it’s a godsend when you just need an excuse to BAKE. So this week’s cake is for the one and only Indera, my beloved cousin who turned 23 on the 18th of May (same as my brother Adam, of last week’s cake). You know I don’t mean that, Ind, I love you and felt I owe you cake… even if it’s not the flavours you mentioned last week. My roses didn’t turn out as beautifully as Amanda’s did, of course, as she is a Goddess and I am still a novice. But I had SO much fun doing this! 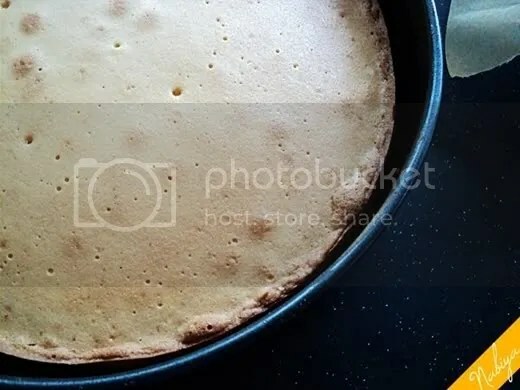 Once the cake is completely cooled – seriously, don’t mess with this bit, you make sure that cake is NOT letting off any more heat or your frosting will just melt right off and it’s gonna look fug. I had to pop my cake in the fridge for 10 minutes before I could frost mine, cos the humidity here on the Equator does not help with the cooling process. Or the impatience. 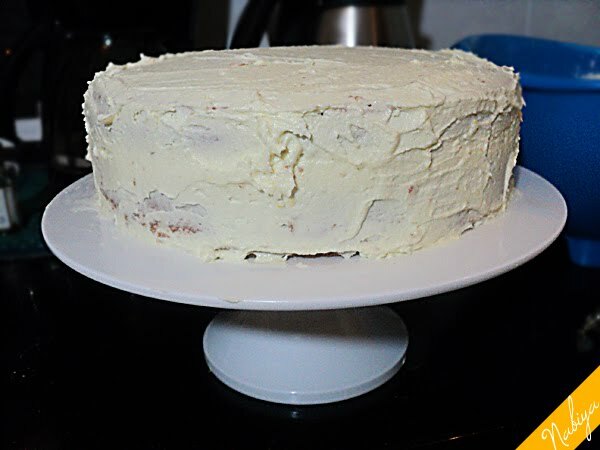 Anyhoo, once your cake is cooled and leveled (you don’t have to have a very level cake if you don’t want to) apply a crumb coating and pop it back in the fridge for a couple of minutes. A crumb coating is just to ensure that any stray crumbs from the cake will be stuck down so it won’t come off into your final layer of decoration later. Attach your Wilton 1M tip, or any large open star tip that you have to your decorating bag (a 16 inch bag should be okay for a 9 inch cake, but it’s fine if you don’t mind refilling) and fill it with your frosting. I can’t possibly describe the method of decorating without sounding like a complete dork (start in the centre and go round and round til you get a cool rose), so I’ll leave that to the pro: Check out Amanda’s tutorial on this cake. As you can see, I didn’t do so well on the roses on the side of the cake. 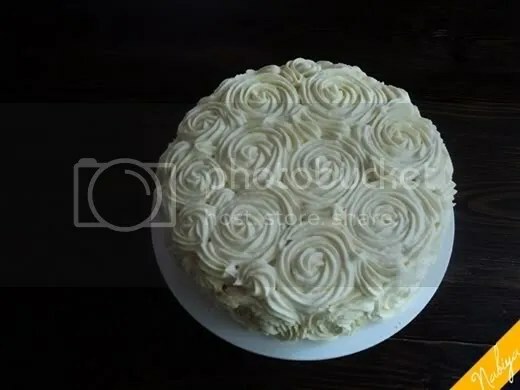 My first batch of buttercream frosting (yes, I realised I needed two batches for this cake) was a little under the desired consistency (smooth, yet not runny) AND coupled with the fact that it was my first time using the 1M tip and trying to create this rose effect. So the roses are a little shoddy. Also, I didn’t space them very well so there’s a lot of filler “petals” in there too. Still love it though!